Most Fridays the Local Colour group meets at 10am at Community Solutions North West and we start our session with a cup of tea and a catch up about our week. 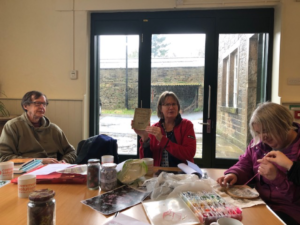 There is time to each share an observation or two, often the group members have something to report from their own research – a visit to Accrington Library, a conversation with a neighbour, a reminiscence about the local area. These conversations usually meander around to textiles and textile production and are peppered with language specific to this industry. Talking textiles in the Local Colour group. We decided to explore these links between textiles and our everyday language in a session a few weeks ago and some of the group came along with their own examples. We began by talking about the Lancashire Cotton Famine of 1861-65 and the poems written in ‘forgotten Lancashire dialects’, then moved onto textile words and phrases found in common parlance. The textile manufacturing industry offered us some easy ways in – ‘cottoning on’, ‘on tenterhooks’. 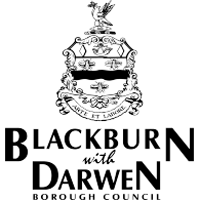 ‘Fair to middling’ was a phrase the group agreed was in common use, but it’s origins (a measure of an average grade of cotton) less well known. From tailoring we found ‘having your work cut out’, ‘cutting your coat to fit your cloth’ and ‘cut from the same cloth’. Threads and fibres a gave us a whole range of common usage, from ‘ties that bind’, ‘common threads’, to feeling ‘unravelled’ and describing something as ‘hanging by a thread’. The group has decided to create a glossary of these terms, and we all agreed to listen out for the use of textile language in our everyday conversations and to share them. 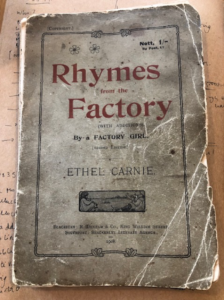 This exploration of language was timely, as during the same session we welcomed a visitor, Janet Swan, who came to tell us about the ‘Finding Ethel’ project (supported by the National Lottery Heritage Fund). The project is exploring the life and work of Ethel Carnie Holdsworth, writer, poet and journalist, suffragist and activist who was born in nearby Oswaldtwistle in 1886. She worked from the age of 11 as a half-timer at Delf Road Mill, and from 1899 full-time as a winder and later a warper and beamer at St Lawrence Mill in Great Harwood. Carnie Holdsworth was the first working class woman to be published in Britain, bringing her lived experience of factory life to her poetry and later to ten novels. This extract from her journalism refers to her attempts to read whilst working in the mill. A reading group, exploring the work of Ethel Carnie Holdsworth will begin in May at Community Solutions North West. Please contact them if you are interested in taking part.